This project was created on 12/21/2016 and last updated 2 years ago. "The floating head aliens have attacked the secret moon base and now it is up to you to take it back." 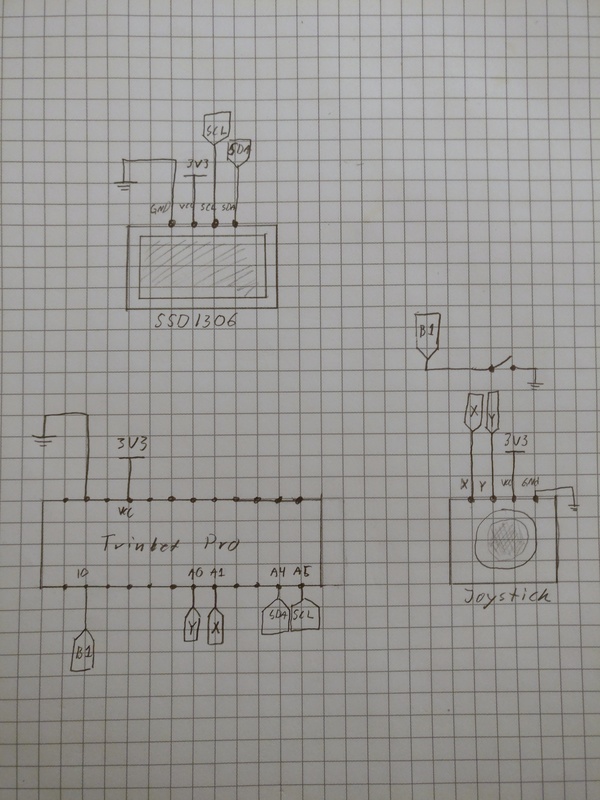 My goal is to implement a game using ray casting graphics (think Wolfenstein 3D graphics) on an Arduino. The display used is a SSD1306 oled display. Joystick and buttons are used for input. This is a ray casting graphic demo that runs on a Arduion together with a ssd1306 oled display and some buttons and an analog joystick for movement. And Adafruits ssd1306 arduino library is used to interface with the display. I changed out the original joystick i had to a PSP style joystick to try and make the controller not be huge. It is sill large compared to the "tv" but it is at least smaller that the first prototype I printed. If I ever continue on this project there is a lot that can be done to make the "game" part of the software more fun, right now it is more a tech demo were you walk around trying to find the aliens and shoot them. It would be fun an try to add some simple AI so the aliens can fight back but I think that might need a faster/better processor than the atmega328 that I am using today. Hope you enjoyed this project and please let me know if you also manage to get the code running. basic sprite support added, to the cpu load minimal I only implemented sprites in form of basic shapes like circles and squares since they are easy to scale. I just tested your code w/ a Teensy3.6 & SSD1306 screen (no button yet, but added spinning in main loop) // the refresh rate is really impressive & the code is pretty tiny. Thanks, it&apos;s fun to see that someone else got it running :-) I was suprised my self that the refresh rate was so good on a 8bit mcu, I guess having a low res screen helps alot. I Ching Calculator for the Sci-fi contest. Know that dinosaur game when you are offline? We built one for real! You are about to report the project "Ray casting on an Arduino", please tell us the reason.